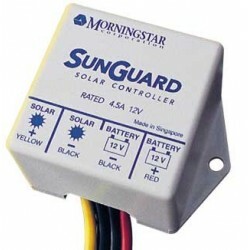 This solar regulator for 12v battery charging does not have lighting control but it does provide high quality solar charge control at low cost for use in manually controlled solar power and lighting systems. 1. SunGuard can be mounted in any position. It is best to mount to a vertical surface and allow space for air flow through the controller. 2. First connect the Battery BLACK wire (negative) to the battery. Use either black wire since they are connected together inside the controller. 3. Connect the RED Battery positive wire to the battery. 4. Connect the Solar array using the other BLACK wire and the YELLOW Solar positive wire. Be very careful not to short circuit the solar array, or the controller will be damaged. 5. 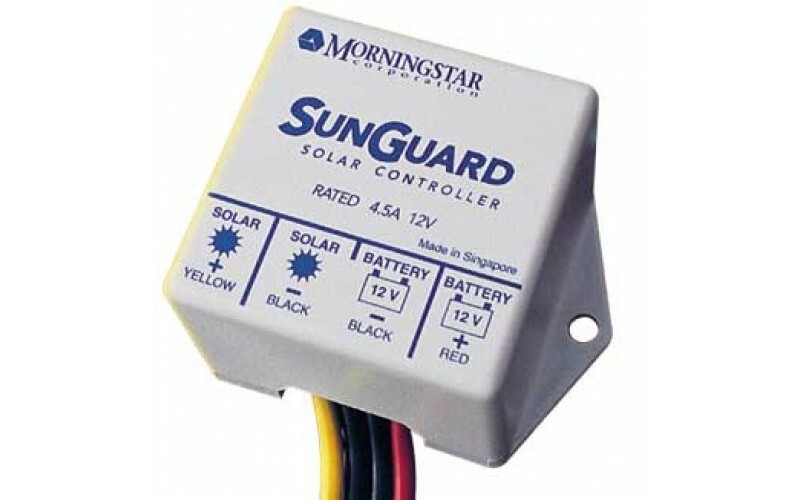 SunGuard prevents reverse current leakage at night, so a blocking diode is not required in the system. 6. A negative earth ground at the battery is recommended for most effective lightning protection. 7. SunGuard can be mounted outdoors. Do not expose to temperatures above 60˚C. Make sure that water will drain from inside the case.